And this excuse makes 30. Dueling press releases on 'the pause', blaming Pacific Trade Winds on 'Atlantic warming' | Watts Up With That? Previously, we had 29 excuses for “the pause” now we have 30. When a paper is published by multiple authors, the universities of those authors often produce separate press releases to highlight the paper. 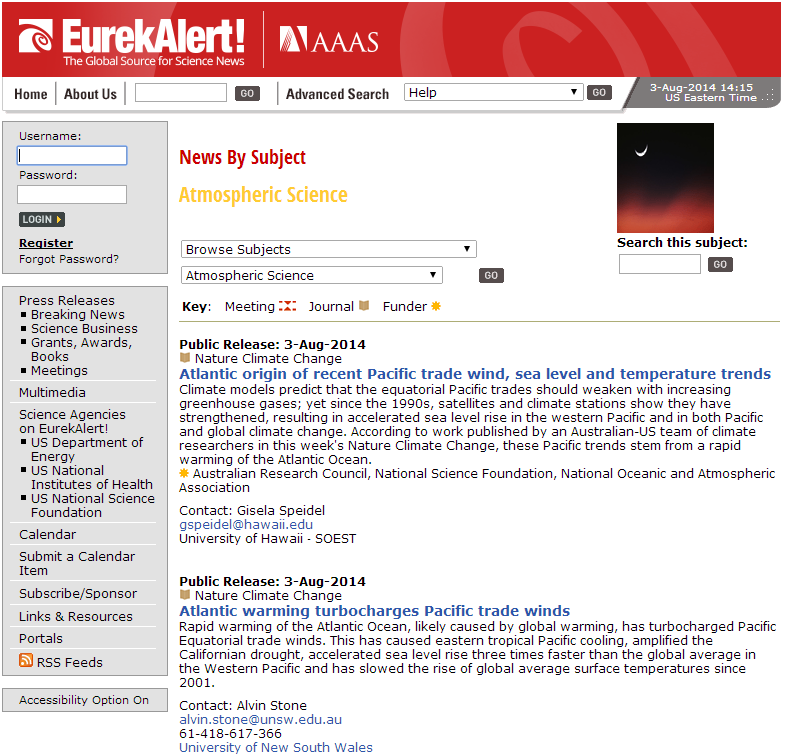 Today, two separate press releases about the same paper showed up right next to each other in Eurekalert, as seen in the screen cap. Problem is though, one paper PR (from the University of New South Wales) places blame squarely on global warming, the other (from the University of Hawaii), only gives it a contributory mention. UNSW also expects a “sudden acceleration of global average surface temperatures”, but there’s no mention of that in the UH press release. Looking at the differences, it isn’t hard to spot the bias towards alarmism at UNSW. Both press releases are presented in entirety below. Commentary follows. It may even be responsible for making El Nino events less common over the past decade due to its cooling impact on ocean surface temperatures in the eastern Pacific. “We were surprised to find the main cause of the Pacific climate trends of the past 20 years had its origin in the Atlantic Ocean,” said co-lead author Dr Shayne McGregor from the ARC Centre of Excellence for Climate System Science (ARCCSS) at the University of New South Wales. The record-breaking increase in Pacific Equatorial trade winds over the past 20 years had, until now, baffled researchers. Originally, this trade wind intensification was considered to be a response to Pacific decadal variability. However, the strength of the winds was much more powerful than expected due to the changes in Pacific sea surface temperature. “The rapid warming of the Atlantic Ocean created high pressure zones in the upper atmosphere over that basin and low pressure zones close to the surface of the ocean,” said Prof Axel Timmermann co-lead and corresponding author from the University of Hawaii. 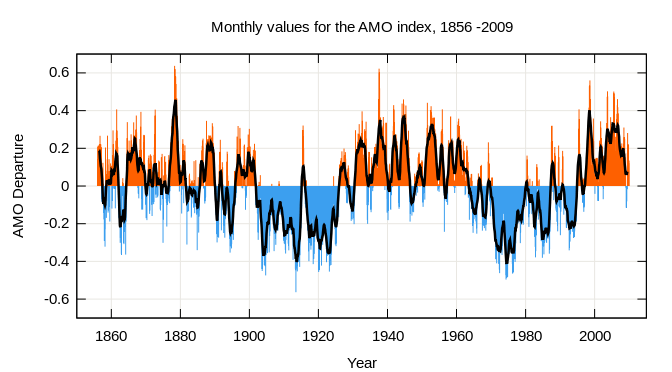 While active, the stronger Equatorial trade winds have caused far greater overturning of ocean water in the West Pacific, pushing more atmospheric heat into the ocean, as shown by co-author and ARCCSS Chief Investigator Prof Matthew England earlier this year. This increased overturning appears to explain much of the recent slowdown in the rise of global average surface temperatures. Importantly, the researchers don’t expect the current pressure difference between the two ocean basins to last. When it does end, they expect to see some rapid changes, including a sudden acceleration of global average surface temperatures. “It will be difficult to predict when the Pacific cooling trend and its contribution to the global hiatus in surface temperatures will come to an end,” Prof England said. Now from the University of Hawaii. Who says the Atlantic warming is “induced partly by greenhouse gasses”. An Australian–US team of climate researchers has solved a puzzle that has challenged scientists for over a decade. Climate models predict that the equatorial Pacific trades should weaken with increasing greenhouse gases. Yet, since the early 1990s, satellites and climate stations reveal a rapid and unprecedented strengthening of the Pacific trade winds, accelerating sea level rise in the western Pacific and impacting both Pacific and global climate. “The answer to the puzzle is that recent rapid Atlantic Ocean warming has affected climate in the Pacific,” say the scientists. Their findings from observations and modeling experiments are published in the August 3, 2014, online issue of Nature Climate Change. In contrast to previous studies that explain the eastern Pacific cooling as resulting solely from natural climate variability, the international climate research team points to a climate feedback that has been overlooked, namely, that the recent Atlantic warming affects the atmospheric circulation over the Pacific, leading to an increased persistence of cold ocean conditions there. “It will be difficult to predict when the Pacific cooling trend and its contribution to the global warming hiatus will come to an end. The natural variability of the Pacific, associated for instance with the El Niño-Southern Oscillation, is one candidate that could drive the system back to a more even Atlantic–Pacific warming situation,” says co-author Matthew England from the University of New South Wales. “Our study documents that some of the largest tropical and subtropical climate trends of the past 20 years are all linked: Strengthening of the Pacific trade winds, acceleration of sea level rise in the western Pacific, eastern Pacific surface cooling, the global warming hiatus, and even the massive droughts in California,” explains co-author Malte Stuecker from the University of Hawaii Meteorology Department. “We are just starting to grasp the scope of the impacts of this global atmospheric reorganization and of the out-of phase temperature trends in the Atlantic and Pacific regions,” adds Fei-Fei Jin, climate scientist also at the University of Hawaii Meteorology Department. Shayne McGregor, Axel Timmermann, Malte F. Stuecker, Matthew H. England, Mark Merrifield, Fei-Fei Jin, and Yoshimitsu Chikamoto: Recent Walker Circulation strengthening and Pacific cooling amplified by Atlantic warming.Nature Climate Change http://dx.doi.org/10.1038/nclimate2330. Australian Research Council (ARC), including the ARC Centre of Excellence in Climate System Science. A.T. was supported through NSF grant No. 1049219. M.F.S. and F-F.J. were supported by US NSF grant ATM1034798, US Department of Energy grant DESC005110 and US NOAA grant NA10OAR4310200. The only problem is, how would they explain similar but larger peaks in Atlantic Sea Surface Temperature, that have occurred before being “induced partly by greenhouse gasses”? Atlantic Multidecadal Oscillation index computed as the linearly detrended North Atlantic sea surface temperature anomalies 1856-2009. The The Atlantic multidecadal oscillation (AMO) was identified by Schlesinger and Ramankutty in 1994 in “An oscillation in the global climate system of period 65-70 years“. In addition to the well-known warming of ~0.5 °C since the middle of the nineteenth century, global-mean surface temperature records1-4display substantial variability on timescales of a century or less. Accurate prediction of future temperature change requires an understanding of the causes of this variability; possibilities include external factors, such as increasing greenhouse-gas concentrations5-7 and anthropogenic sulphate aerosols8-10, and internal factors, both predictable (such as El Niño11) and unpredictable (noise12,13). Here we apply singular spectrum analysis14-20 to four global-mean temperature records1-4, and identify a temperature oscillation with a period of 65-70 years. Singular spectrum analysis of the surface temperature records for 11 geographical regions shows that the 65-70-year oscillation is the statistical result of 50-88-year oscillations for the North Atlantic Ocean and its bounding Northern Hemisphere continents. These oscillations have obscured the greenhouse warming signal in the North Atlantic and North America. Comparison with previous observations and model simulations suggests that the oscillation arises from predictable internal variability of the ocean-atmosphere system. Personally, I don’t think any of these climate scientists have a clue as to what they are talking about, much less what drives the climate in cycles. August 3, 2014 in AMO, Hiatus in Global Warming, Sea Surface Temperature. damn…we have another ocean?..and it’s called Atlantic?? ..and the Pacific have been controlling hurricanes in it? is there nothing it can’t do?…. But.. I thought the science was settled? Doesn’t Chris Turney work at the UNSW? Now there is a clueless wonder! This is but a minor problem. They will just have to “adjust” the past high points away like they did to the warm period in the 30s and 40s in the US — or like they disappeared the Medieval Warming Period. It is all in the “adjustments”. Priceless – this mob remind me of a certain christian sect who were categorically predicting the arrival of the big “A” so far their score is nil from many re-interpretations of the “facts” they shoulda been using computer models…. The science is turning like art under the Catholic Church in the 13-16 century to something bizarre and political? Climate is 100 % driven by 3% antroproghenic CO2? 30 excuses to date? Shouldn’t it be 50 by now? I’m blaming global warming for the paucity of excuses. Is there ANYTHING it can’t do?? We just need to see what all the other universities put in their press releases and we can see how good the consensus is. Or is it how much they need the funding? The fact that there are now 30 guesses means they are dazed and confused. The models failed to see the standstill because they are primed to react violently to co2. When will they just admit the AMO and PDO are significant climate drivers – more so than CO2? Somebody should tally the number of excuses that have been claimed just by England or the University of New South Wales. It’s clearly more than one. I guess that’s why he’s been called “say-anything Matthew England”. So now the climate alarmists have a list of 30 possible reasons that they are uncovering to explain the warming hiatus. Which tells me that they openly admit that there is plenty about the Earth’s climate that they don’t understand and are still learning. When leads me to a logical fallacy they are creating regarding the human CO2-induced climate change theory: if they are still learning all these things about the Earth’s climate, how can they ascribe the 20th century warming to human CO2 emissions in the first place? Why aren’t any and all of these factors included in their precious models? Don’t know who originally said this (Shakespeare? ), but “Oh what a tangled web we weave when……..”. And I’m not even a scientist. The NE trades arrive unmitigated at my location with a probability of 60%, eg more than half of natural airflow. No noticeable increase in 23 years. No significant change in the data records either. I would have thought that the Australian Research Council’s cash register would have been locked up by now. So it seems that it is ‘surface warming’ ( induced partly by greenhouse gasses ) that has caused the hiatus in …. global warming. Chalk up another victory the the mighty CO2. A simpler way to describe this process would be “negative feedback”. The warmists predicted a reduction in wind speed in the tropics which reduces evaporation which causes there to be less latent heat movement in the atmosphere which causes there to be less radiation loss to space in the tropics which is one of the model fudges made to create extreme AGW in the phony (fudged) theoretical general circulation (GCM) models. The warmists adjust their models and their theory as necessary to keep the extreme AGW prediction alive (It is now on life support). The observed reduction in low level clouds was explained away with AGW. Some scallywags noted that the reduction in low level cloud in the same latitudes that experienced warming could be the explanation for the warming rather than CO2, as the CO2 theory predicted a different region to warm. The sudden inhibiting of El Niño events (Do you remember the warmists’ prediction of future super El Niño events caused by AGW, Hansen’s loaded dice?) 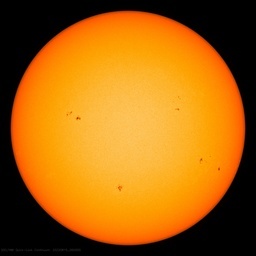 is due to the abrupt change to the sun, not due to a warmer Atlantic ocean. Every new revelation is more evidence they’ve been feeding us a load of crap for at least 100 years. I long for a time when shame alone would have guided them toward greater honesty. Do they really not accept these missives are admissions of prior ignorance? They also continue to lack the courage to avoid weasel (stoat) words. That alone should clue us that the BS de jour is no different this year than all years previous. I would love to have read in either of these releases “we find we were well off the mark when… and very wrong when we said…”. (please don’t ROFL at our horrendous new record of 0.9C at 6.29 am) which naturally means we’ll probably have to wait another 100+ years to match it, which ipso facto will prove CAGW beyond doubt in the intervening period due to the Pacific trade winds. The evidence is mounting up here skeptics. Just to point out that large areas of Southern Australia experienced their coldest minimums since the 1880s this morning. This just in from Hockey Schtick. Can we assume you’re referring to the Seance of Climatology here? In medicine when there are 30 treatments for a given disease (as there were for post-hepetic neuralgia when I was in practice) you know that none of them work. Thanks, Anthony, this has given me a chuckle. I nominate this excuse #30 as the “turbo-charged trade wind” excuse after the UNSW header. Climate science is certainly giving chiropractic medicine a boost. Like chiropractic, all AGW maladies may be cured with adjustments done by the right specialist. Personally, I’ve always found the Deltoid blog to be the “canary in the coal mine” when it comes to judging the degree to which the hive intends to commit promotional, agit-prop hype-resources to any given, tenured-hack’s “profession-of-the-true-faith”. Likewise, I’ve always found the Deltoid blog’s motor-mouth clap-trap to be a good leading-indicator of the the severity of the public beat-down the hive intends to administer to any given heretic, naturally, but also to those ostensible good-comrades who are, technically-speaking, orthodox in their views, but exhibit an insufficient scare-mongering zeal in their street-theater panic-attacks. So let me just check out what the ‘toids are sayin’ about the above two papers. YIKES!!! I can’t believe what’s happened to Deltoid-land! I mean, like, the Deltoid blog has degenerated into a last-gasp, bezonian (yep!–got that one from the Thesaurus), bozo-nian (made that one up! ), “bill”-and-“Lionel” creep-show! I mean, like, Deltoid is currently in a vegetative state so complete, so utterly devoid-toid of “meaty’ thought, “red-blooded” passion, and “sinewy” speech, that it would not be out of place on the menu of some militant-vegan, flatulence-spewing hive-eatery, even! Leave any categories out that anyone can see? I don’t know about the trade winds, but the excuse machine seems to be turbo-charged. Trade Winds! That’s the ticket. No it’s really just Headlines! That’s the way to control the discussion – and keep the sleeping masses asleep with a never-ending drone of sciency-sounding silliness. Question: Was the pause predicted by any of these so-called experts? You know, something like “Trade Winds Likely to Cause a Pause in Man-Made Global Warming!” perhaps a few to five years before the pause? No? Hmmmm. Science. Not what it once was. SO now the normal ebb and flow of the ocean due to jet streams is not a causes of warm water distribution? The trade winds checked in with the CAGW scientists and spread their warming instead of creating an El Nino? Would someone please explain to me HOW this natural wind checked in and said ‘Hi im here and I am caused by man made global warming’… without a shred of empirical evidence…? You guys are missing the one I think is the funniest….. Similar to dueling pressing releases is dueling reporting. This is my favorite example of dueling reporting of the same event, the opening Ivanpah Solar Plant. One says the opening a success, the other a failure. Same day. Same event. I see bad co2 rising. There’s bad co2 on the rise. Just because it is published in Nature or Science doesn’t mean it’s wrong. “Sprawling across 3,500 acres (1,400 hectares) in the Mojave desert near the California-Nevada border, the $2.2 billion Ivanpah solar thermal power plant has more than 300,000 mirrors that reflect sunlight onto boilers housed in the top of three towers, each of which is 150 feet (45 meters) taller than the Statue of Liberty. And, for 1/5 of the price of this 392 MegaWatt solar reflector plant, able to receive solar power only 6 hours per average day but covering 3,500 acres with sun-baked glass, I can build a dual-cycle regenerative heat-exchange fed gas turbine that will turn out 550 MegaWatts of constant power every hour of every day on just 15 acres. And build it in less time at only 1/5 the cost of this solar “wonder” rammed down our throats by the Obama administration and its new medias. Let’s make sure I’ve got this right. They built models of the climate, which predicted that warming would cause Pacific trade winds to slow. They observed high winds, rather than the expected slower winds in the Pacific, so they investigated to determine what caused that, and they concluded it was caused by… global warming. So if the Pacific winds had slowed down, this would have been confirmation that their models were right and global warming was causing it. In fact, Pacific winds picked up, and the cause is … global warming. I don’t know how anyone can question them. The warming actually causes cooling temperatures, once again. There is only so much BS that a smart climate scientist can stand I imagine. At some point, they have to turn on each other. Looked at their paper. It is a mish-mash attempting to tie in the climates in the Atlantic and Pacific oceans with the U.S. climate in between. It is not clear why they think this can be done. Paper has some nice graphics but these are not much help. The only interesting thing I noticed is that they show eastern and central Pacific temperatures completely in La Nina mode. That probably kills the expected El Nino that is supposed to save the warmists from the hiatus any time now. It is a false hope of course because the La Nina that will follow it will take it all back. Anyone who ever commanded on a battlefield, or a training simulation of one, recognizes what this is. Emerging Panic amongst the troops, with a possible rout soon to follow. The formation lines are now visibly breaking. It must be really tough on the CAGW faithful that Mother Nature’s pause (plus Antarctic sea ice, lack of increasing weather extremes, rediscovery of Darwin’s Voyage of the Beagle insight aboutnthengrowth of coral atolls,…) now shows how stupidly wrong they are. Expect panic signs to increase. Great fun to watch from the other side. I am so glad I went to the Uni of Sydney. But that was a long time ago, when we (the Geoscience Group) were grappling with the hypothesis of Continental Drift and Plate Tectonics. Needless to say I am still a skeptic in that regard, given the number of continental rocks found in the oceans plus many other anomalies that don’t fit the hypothesis. Unfortunately, anyone in my profession that questioned this dogma would be facing ridicule and the sack. I’m reluctant to say “Good job, Andrew Revkin” (@ NYT’s Dot Earth) lest he draw even more fire from the climate fearosphere, but he didn’t hesitate to show that the study is controversial. Co2 causes WarmColdDroughtFlood everywhere always and some places never. Surely then this must also be the cause of the increasing Antarctic sea ice and the severe cold snaps and the bumper ski-ing conditions in SE Australia? “Parts of Australia’s southeast have shivered through their coldest August morning in over 50 years. If there was ever a day to stay in bed that bit longer it was Sunday, with overnight temperatures plunging below zero across New South Wales, Victoria and the Australian Capital Territory. In New South Wales Narrandera in the Riverina dropped to minus five which is nine below average and the coldest August morning in 40 years. Those in Cooma awoke to a very frosty morning with a low of -10.6 degrees while at Perisher Valley it dropped to a bone chilling -13. Sydney didn’t escape the chill with the western suburbs of Campbelltown, Camden and Richmond all dropping below zero. The city itself had a minimum of just 5.5 degrees, the coldest in four years. Could it also possibly be the reason that the Ebola virus has reached the USA, Brazil performed badly in the World Cup and Mischa Barton’s career has hit the skids? Calling Professor Chris Turney from the University of NSW. We need a rapid turbo charged expedition to mid Atlantic to do some urgent on the spot research. Don’t think there are any penguins there but some scientific tourists could be enticed to photograph the plentiful hump back whales and bottlenose dolphins. And there could be a popular view to give Antarctica a miss this year. Well England and his mob at UNSW have to keep up the alarmism especially given the demise of the Carbon Tax here in Australia. Unfortunately, I can be certain that the Sydney Morning Herald will write only about the UNSW press release. The more moderate HU press release will not factor into it. Sir Walter Scott In the poem “Marmion.” It was about the battle of Flodden in 1531. To say the Atlantic controls the Pacific is like saying the tail wags the dog. If the Atlantic does anything, it responds to the Pacific oscillation in a manner that is as harmonic as a heart beat. Just as the heart goes “fub-dub” with a strong stroke and a weak stroke, the PDO is a huge ocean’s oscillation and the AMO is a far smaller sea’s oscillation. They work in tandem. This study may be on to something, in that it senses the Atlantic’s contribution to a larger cycle, however they then negate the value of their discovery by focusing on (I imagine) funding. Rather than focusing on the big picture of a 60-70 year cycle, they focus on a too-short time period, because their real focus is on pleasing the government, who dangles the candy of filthy lucre. This crass materialism manifests when researchers (or their press agents) make statements that I doubt can be verified, due to a lack of historic records. For example, these researchers suggest trade winds are now “turbocharged” to record-setting levels and that the Atlantic is warmer than it was 60-70 years ago, during the last cycle. (But I am thankful they didn’t drag out the word “Unprecedented.”) As far as I know, these claims are something new, and which require further research, before they are accepted as being founded on fact. If the government wanted to face reality, (rather than face its dream-world of having power where it has none,) it would promise funding only if these people stopped kissing a–, and got down to facing the truth Nature displays. Unless we understand the simple “heartbeat” between PDO and AMO, we cannot know what we should call a normal rhythm, and until we understand what a normal rhythm is we cannot understand what constitutes (in this analogy) “fibrillation.” For all we know, such a “fibrillation” (where the “fub-dub” of PDO and AMO gives way to chaos,) might indicate the onset of the next Ice Age. It might therefore be wise to learn more about what the ordinary 60-70 year cycle entails. Such a focus is not apparent in the above press releases. There is something sad and ridiculous about colleges and researchers putting on an act, hoping for funding. I know they are desperate to pay their bills, but do they understand how downright pathetic they appear? Have they no dignity? Have they no shame? “We saw that the rapid Atlantic surface warming observed since the early 1990s, induced partly by greenhouse gasses, has generated unusually low sea level pressure over the tropical Atlantic. Really ? How exactly do they now this for a fact ? Notwithstanding the BS, how much do they think that this “partly” is ? Australian Research Council (ARC), including the ARC Centre of Excellence in Climate System Science. A.T. was supported through NSF grant No. 1049219. Sorry, Battle of Flodden in 1513. 30 excuses to date? Shouldn’t it be 50 by now? I’m blaming global warming for the paucity of excuses. When it gets to 57 it’ll be time to “can” it. So if Atlantic warming create a low pressure area over it would that not mean air would start flowing toward it and thus slow down the pacific trade winds? ( trade winds are at the surface level at least as far as I can remember from old sailing history) so a low would need to be filled and may slow down the trade winds “up stream”? IE to the west. So, essentially they say global warming caused the pause in global warming, no? That’s a good one. This was dotingly served up in the Melbourne Age today (the australian equivalent of the guardian). Without any hint of irony they presented the whole thing as hard fact and bleated for more action. The related cartoon – rubbishing our prime ministers removal of the appalling carbon tax was telling. Give them credit , they certainly know how to do ‘science by press release so everyone knows their loyalty to ‘the cause’ and how to give the ‘right results ‘ for grant sucking. Heads I win tails you use seems to be normal pratice in climate ‘science’ but how much actual data do they have on the Atlantic Ocean basin given the size of the place you need rather a lot to come up with a valid result , while we know that in relationship to area in reality there is very little data on the deep oceans. No wonder warming has paused, there are thirty processes going on that cause er…. pausing. Fortunately only CO2 can cause warming, I’m glad that’s settled. The answer is obvious, the smart scientists went into science, the morons went into ‘climate science’. Climate science is populated by idealistic fools who’s objective was always to save the world – from something. They’re now too far in to backtrack. Im staggered there could be so many errors in one article. Global Cooling Deniers are really getting desperate now, but the news is all bad. Go back and look at the reanalysis that Joe D presented last year. The cooling once the AMO turns cold is immense. But hey, science is settled right? Lot is written about N. Atlantic quasi periodic variability (‘oscillation’) and far less understood. Chain of the events doesn’t start with the AMO. The Arctic ocean floor is slowly splitting up, the result are two semi-permanent atmospheric pressure low systems, the Icelandic and Aleutian . The Icelandic low moves the N. A. SST. On the other side of the globe the North and the Central Pacific tectonics work in a push-pull coupled arrangement, as a result the Aleutian Low and the ENSO bear responsibility for the Pacific, not the AMO. The AMO signal is usually defined from the patterns of SST variability in the North Atlantic once any linear trend has been removed. This detrending is intended to remove the influence of greenhouse gas-induced global warming from the analysis. So, it’s detrended North Atlantic SST. Furthermore, the postulated AGW signal (not that I believe in any of it) is significantly non-linear in time (basically starting significantly around the mid 20th century), so simply detrending the whole series since ~1850 is nonsense. Conclusion: AMO is neither Atlantic nor multidecadal – it’s a mode of variability in global temperature indices at all timescales and it’s of course manifested in non-global temperature indices as well. It very likely displays irregular periodicities at all timescales. You can call it climate change. PDO is more or less just the slope of the so-called AMO. Amen. “Climate Scientist” is turning into a pejorative term. If the Atlantic has warmed so much, where are all of the Class 6 hurricanes they graunteed would be coming? The warm phase of the AMO since 1995 is associated with increased negative NAO/AO episodes, and negative NAO/AO is associated with weaker trade winds. Man, when will you ever get the idea of labelling a graph so we can know what the wiggles actually are? Who’s SST ?? What “atmospheric pressure”? What is “tectonics” meant to represent. “New research has found rapid warming of the Atlantic Ocean, likely caused by global warming, has turbocharged Pacific Equatorial trade winds. But the AMO has cooled moderately recently. Vuk seems to be the science equivalent of a pole dancer. From time to time he gives tantalising glimpse of something that looks interesting but there no chance of getting a closer look ! Which is also a result of global warming caused by human emissions of GHG !! Don’t be too cynical. At least Timmermann and his group are attempting to understand the mechanics of ocean cycles, how they interact and how they affect climate. They are doing the donkey work of the Curry / Whyatt stadium wave hypothesis. What this paper actually finds and gets into print is that global warming stops global warming. ie negative feedback. Neg. f/b is the nemesis of AGW , tipping points and run-away climate change. They found a non catastrophic AGW effect in their research and published it. How fragmented are the friggin’ tortoises gonna be if we get 4C hotter and sea levels rise six miles etc. etc. Make you figgin’ minds up. There is a small relationship between the AMO and the ENSO however. It’s just that the authors got it backwards. It is the ENSO that influences the AMO (and only occasionally that is). First, let’s just look at the ENSO and the AMO together going back to 1854. They are not really related (except sometimes the AMO seems to lag behind the ENSO by about 8 months. This only appears in the really big spike ENSO events, the Super-El Ninos and the large La Ninas). Otherwise, not a well-defined correlation at all. Let’s do a scatter of the ENSO versus the AMO for each month. This is as random as it gets with an R^2 of only 0.0059. That passes all tests as being random or no correlation. But then, let’s lag the AMO by 8 months and see if that lagging influence from the large ENSO events shows up. Sure enough. R^2 is still a measly 0.06 but ten times more correlated than the straight-up comparison. The climate scientists got it backwards, once again. as it says there, it’s all in my comment at the above. They said their trade wind data only goes back to the 1860s. So we are now experiencing the strongest trade winds since the 1860s. There is literally no way of knowing if they are unprecedented. This is alarmism at its best. I also have the Pacific Trade Wind Index going back to 1871. Let’s compare that to the AMO. These scientists need to be disciplined by someone. This reminds me of Lubchenco and friends suggesting some AGW winds were causing the natural & seasonal upwelling and ocean dead zones off the Oregon coast. connection which they can’t possibly have any real scientific measurement to support. They can’t possibly have anything to substantiate that absurd claim. I’m no scientist but I find that claim laughably impossible for them to know. It’s my understanding that greater wind velocity over the ocean results in an increased rate of evaporation which cools the ocean rather than injects heat. And that the ARGO ocean temperature array data that confirms that. So the idea that CO2 emissions caused warming is producing winds that push the warming into the ocean is crap. There is an arcane reasoning, utterly incomprehensible for most climate scientists, which demonstrates beyond reasonable doubt that rapid warming of the Atlantic Ocean could not possibly turbocharge Pacific Equatorial trade winds. 1. In fact there was no Atlantic warming whatsoever during the last 15 years, a slight cooling perhaps. 2. “No warming” and “rapid warming” are two completely different states of affairs, they are inconsistent with each other. 3. From a single false statement anything follows. Please note that AMO is computed as “linearly detrended” anomalies, and since the trend is upward, the current “spikes” are higher than previous ones. # 31. Carbon dioxide doesn’t drive temperatures, and due to the lack of sufficiently strong positive feedbacks there is no runaway greenhouse gas warming. Any impact from trace-element quantities of human-derived atmospheric CO2 is thus so miniscule that it is lost in the noise of natural variation. Therefore not only does dangerous, catastrophic or runaway man made global warming most definitely not exist, but any man made warming from the greenhouse effect itself is rendered effectively irrelevant. I don’t know: anyone think this theory could fly? I have never heard of “turbocharged winds” before. Is this a weather term or did they just make it up? Hot Atlantic? The equatorial Atlantic looks to be the coldest I’ve see in the 7-8 yrs I’ve been following frantic climate psychosis. Looking at the cold bar of ocean across the equatorial Atlantic, I would propose we have a similar phenomenon to ENSO identified and named – maybe use Swahili terms: Mvulana (boy); Msichana (Girl) for hot and cold conditions in the eastern Atlantic. They must work about the same. If they mean North Atlantic, well yeah, St John’s Newfoundland is suffering a 20C (68F) heatwave. Shed new light? Found a potential linkage? Oh, but NO, they “SOLVED” the puzzle with their modeling of what is happening. Talk about arrogance. The AMO will chill them soon enough. The researchers and press writers left out the multiverse in their puzzle solve, but that can be done easy enough in the follow-up research. It is the brain storm of the publicicist who writes these blurbs for the UNSW. It is an attention getting phrase employed to tout the study. This sort of stuff is designed to garner prestige and snare more funding. I will admit I did not attempt to read the entire paper but as a semi-retired South Pacific operational forecaster I am a bit shocked. For the past 17 years I have tracked the semi- permanent Anti-cyclone in the eastern S. Pacific and have found its intensity is due to two main factors. One is flow from 500 to 200 hPa moving west to east and the other is the assimilation of the traveling Surface Anti-cyclones that move at more or less on a regular cycle west to east. These moving Highs comprise the ‘sub-tropical ridge’. The anti cyclones provide the trades. While I don’t get involved in the N. Pacific I believe it functions in a similar fashion. I’m tongue tied, I just don’t know what else to say. 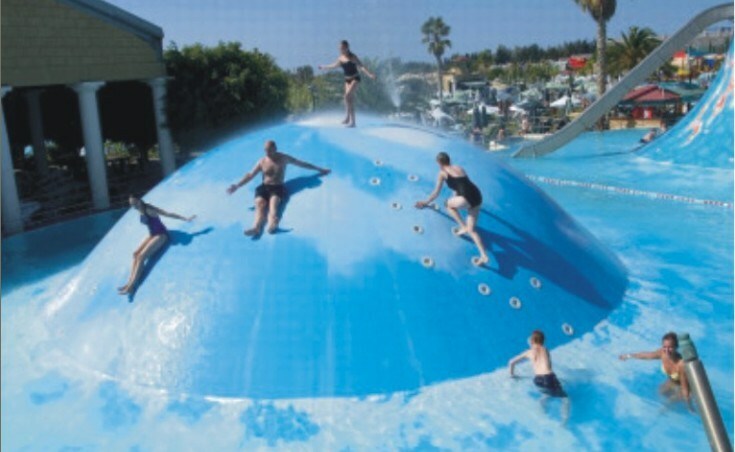 They’ll next invent a “Hidden El Nino,” in which the heat goes down into the Pacific. instead of up. There will be great rejoicing among the “low information” believers, the KoolAid garglers, and the American Lysenkoists. So now the experts have given us 30 reasons why their theory isn’t quite living up to their expectations. They have yet to postulate the most likely explanation as to why their theory is not matching observation, it’s wrong! Gotta go. We’re discussing the fake moon landings at the flat earth society tonight. It would be nice to have a summary list of all 30 excuses, with links to the WUWT posts. The 30 aren’t apparent in the “Hiatus” category. Maybe keep the list under “Climate FAIL Files”?